I have been using Shara Shara Honey Bomb for months, and I am absolutely in love with it. Because of this product, and the Sleeping Veil, Shara Shara is quickly becoming one of my favorite Korean skincare brands out there! So if you’ve never used ampoules before, they’re basically like a thicker essence that you use under an emulsion or moisturizer. Ampoules should have a lot of nutrient-rich ingredients for your skin for targeted treatment. And Shara Shara’s ampoule does not disappoint! 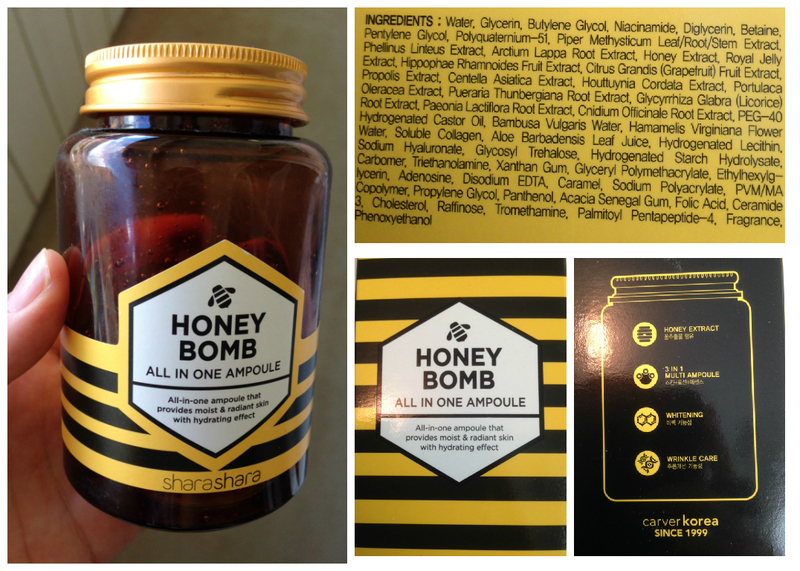 Shara Shara’s Honey Bomb All in One Ampoule is pretty much what it sounds like — an explosion of honey ingredients in one single ampoule that delivers tons of great ingredients to your skin! 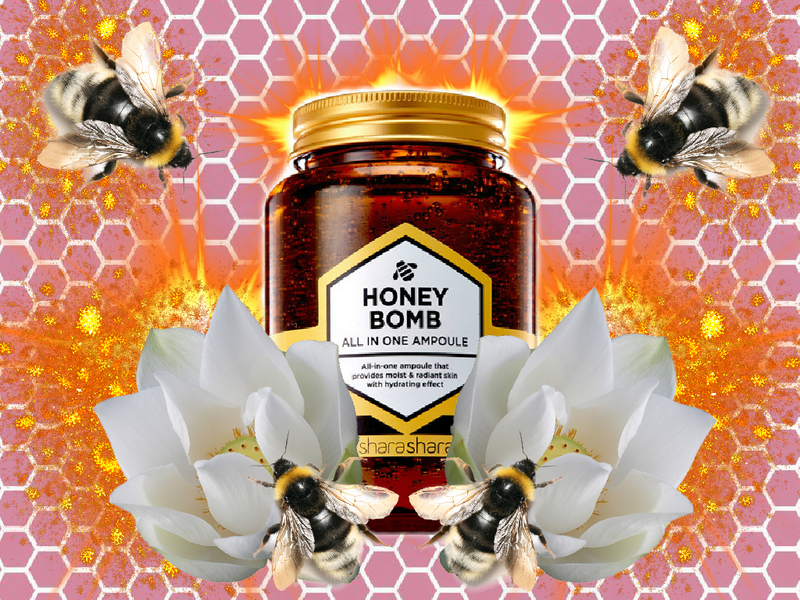 This *bomb* ampoule contains three different types of honey-based ingredients: Manuka honey, royal jelly, and propolis extract (read below for more info on what makes these ingredients great for the skin). When I was first looking for a honey-based product, this is actually the only one that I was able to find that includes honey, royal jelly, AND propolis all in one product. In addition to the honey, royal jelly, and propolis extract, this ampoule also has an amazing array of other extracts and vitamins that are great for the skin such as niacinamide, collagen, sodium hyaluronate, etc… Truly, this is a great multitasking ampoule with lots of nutrient-rich ingredients and moisturizers! Manuka Honey: This honey is made from the flowers of the tea tree plant, which has many medicinal properties. This honey is naturally antibacterial and creates a protective barrier to help the skin heal. It is also a strong anti-inflammatory and anti-oxidant. It also helps stimulate new cell growth because of its natural lactic acid. Royal Jelly: A honey bee secretion used in the nutrition of larvae, royal jelly is also highly nutritious for the skin with its high composition of amino acids, proteins, fatty acids, vitamins and minerals. It also helps stimulate new cell growth by increasing collagen production. Propolis Extract: Another bee secretion that has around 300 active compounds, propolis has a wide range of antibacterial properties and it also promotes healing from burns and other wounds. So let me move on to the product itself! Honey Bomb comes in a thick dark brown bottle to prevent light from affecting the product. There is so much product in this bottle! Even though it’s a little expensive for a Korean skincare ($30-$40), you get an amazing 250 ml (around 8 oz) of product. The consistency of this ampoule is very thick and gooey, almost like thicker gel. A little goes a long way, so about a dime-sized amount is more than enough for my entire face. It has a light fragrance of honey in it, which smells absolutely amazing!! Seriously, it’s a struggle for me not to just stick my tongue down the bottle. Because it is an ampoule, you want to use it over your toners and essences, but before you use your moisturizer. It spreads nicely and dries really quickly to a matte finish. I’ve been using this product for months, and I’m absolutely in love with it! It really helps to lock in moisture and makes my skin feel amazing. Some nights when I need extra hydration, I slab a bunch of it on my skin and let it absorb slowly like a mask. I’ve noticed that it does help with both my acne and my rosacea. And it definitely doesn’t cause me to break out more because there are no horrible solid carrier oils that cause so many problems for me. I highly recommend this product! It’s a little expensive, but you get a LOT of it, and it has so many wonderful ingredients packed in! It’s moisturizing, helps with acne and dry skin, with great anti-aging benefits too. Seriously, get yourself a jar of this amazing product now. I’m so glad to see you’re back! I discovered your blog early last year when I was just getting started in Asian Beauty and yours were some of my favourite reviews, can’t wait to see what products you’re using now, has your routine changed much over the year? Thank you for your very sweet comment! I’m glad to be back too. My schedule is still crazy (and will become crazier again soon), but I can’t neglect this blog like I have been. I have SO many products that I’ve used and want to write a review on! My routine has changed a lot over this past year! It’s actually really simplified most of the time now (this will be a subject for a post in the near future). Not an Asian Beauty product but if you ever get the chance try Egyptian Magic all purpose cream. The ingredients are Olive oil, beeswax, honey, propolis, pollen and royal jelly, it’s amazing stuff and great to scrunch into your hair too. I’ve heard great things about Egyptian Magic. And yes, while I love that it has so many bee-related products in it, I’ve avoided it for one big reason: the bees wax. Unfortunately, I know that anything that is solid at room temperature clogs my skin and makes me break out, so I’ve avoided it! Maybe one day I’ll be adventurous and give it a try… Thanks for the recommendation! I know… I can’t find it anywhere! In fact I noticed that a lot of Shara Shara products are quickly disappearing and can’t find them again. Maybe they’re going out of business?? I just found a potential replacement, and will be blogging about it soon. Stay tuned!